I mean I did tell you it was going to be all Mexican for at least the next few days. Mexican foods will never get old. Especially churros spiked with beer. Seeing as the idea for these was a New Years dessert, I just figured the beer was necessary. BUT the beer is not just here for fun. 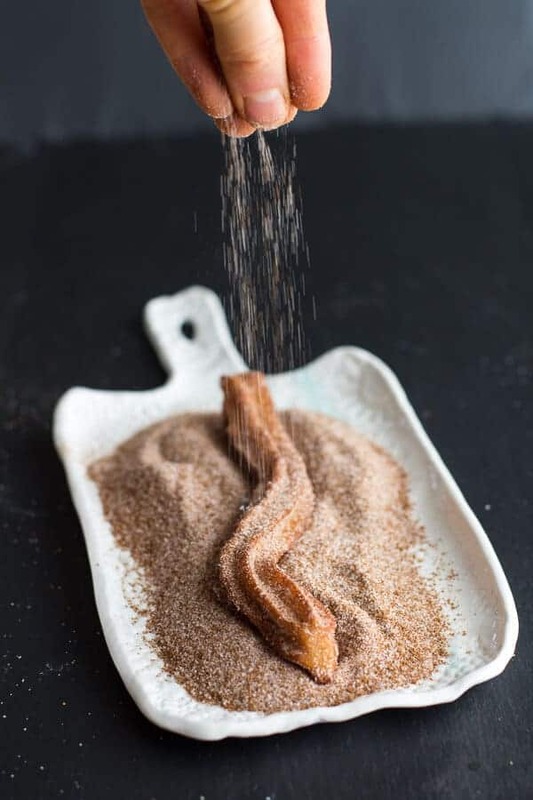 Nope, it is actually the secret that makes these churros better than any others you will ever have. Beer acts as a leavening agent that is going to make your baked goods light and tender. Water and milk have nothing on beer. I learned this from the queen of beer herself when she posted some glazed beer doughnuts that are probably some of the best doughnuts you will eat. I mean jeez, just look at how light and perfectly crisp these things look! I figured churros are a lot like doughnuts, so I added some beer. Well yeah – they are, and it worked. Amazingly! It did take a couple of tries to get them just right, but that was pretty much only because I tried baking them first. Yeah, I tried. I tried to make them just a little healthier, sorry – no go. Oh well, the results have already been consumed. These fried churros are like one hundred times better. And they are also faster. I do promise come January second I will have a healthy recipe up. Really, I promise. I already have a few too many healthy + colorful recipes in mind. Ok, and a few creamy cozy ones too. But until then I have just decided to go all out. No diets before January second anyway, right? Anyway, these churros may just be everyone’s new favorite Christmas/New Years tradition. My eldest brother Creighton is PUMPED about these churros. His words to be exact, “Seriously, those Churros are soo good! I could eat 100 of em). Now those are the words I live to hear. Seriously, and sentences like that make my week. But it was not just Creigh who loved these. All the Gerard’s, parents +brothers + cousins, even the newest addition (my cousin Matt’s very good choice for a serious girlfriend – Caroline. Yay, for another girl! We are finally starting to even out) loved them. And they take like a total of thirty minutes to make. 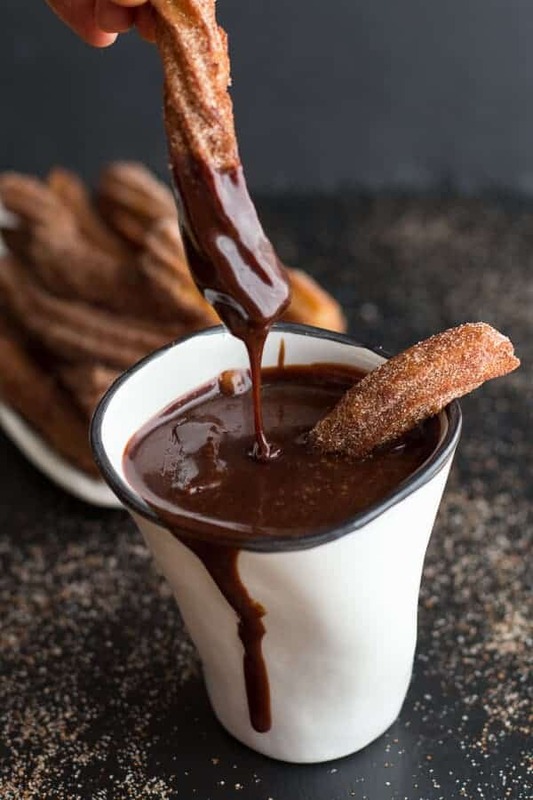 That would mean that you can have fresh, hot, crisp churros, along with the sweet chocolate dipping sauce, in no time. Bonus, these are perfect for New Years. Grab, dip (but I really mean drench), devour. Oh, and a little note on the sauce. For the base of the sauce I used this Cajeta Sauce recipe that I will be telling you guys about very soon. Cajeta is authentic mexican caramel sauce and oh my gosh it is the most amazing thing ever. Unfortunately, it takes about two hours to make, so if you do not feel like doing this step you can just use a can of store-bought Dulce De Leche. Still very good. To make the chocolate cajeta sauce. Add the beer and chocolate to a small saucepan and place over medium low heat. Gently stir the melting chocolate into the beer. 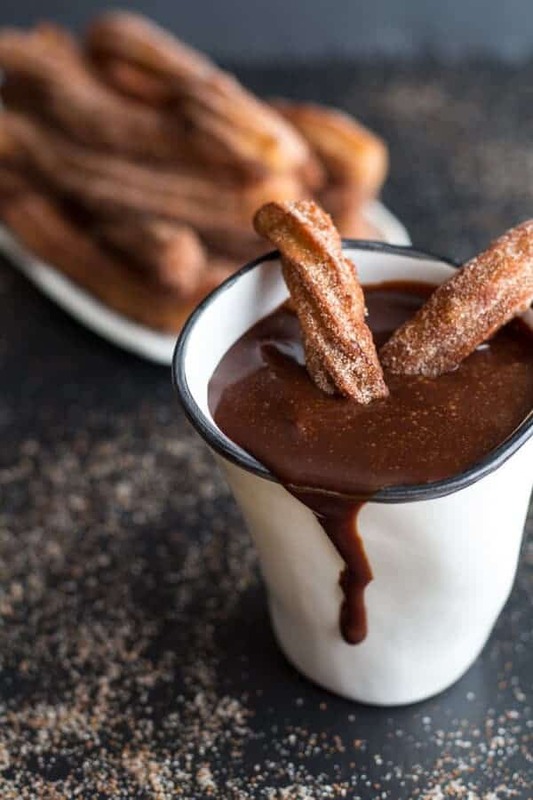 When the chocolate is smooth, remove from the heat and stir the salt into the cajeta sauce (or dulce de leche) until smooth. Keep somewhat warm and set aside. To make the churros. 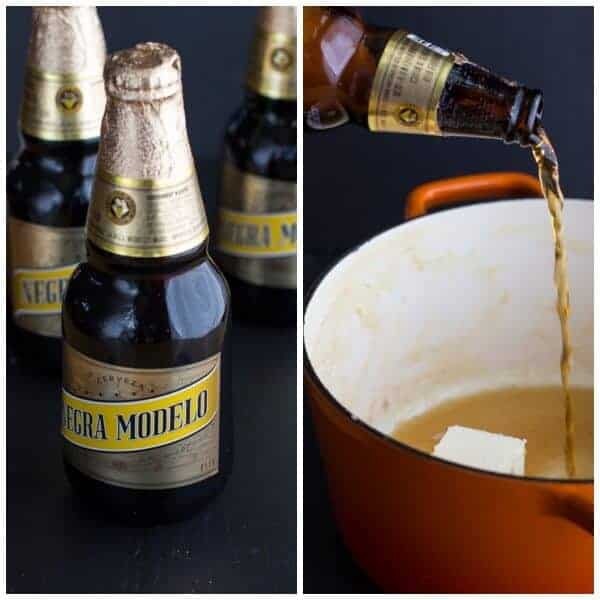 In a medium saucepan, combine beer, butter, brown sugar, and salt. Bring to a boil over medium heat (make sure to actually bring the mixture to a boil). Add the flour all at once, stirring with a wooden spoon. Cook and stir until mixture forms a ball and pulls away from the sides of the pan. Remove from heat. Cool for 10 minutes. Add egg and vanilla, beating well with a wooden spoon or rubber spatula. Transfer mixture to a piping bag fitted with a large star tip or just snip the corner off a gallon size ziplock bag and skip the tip. In a medium bowl, combine granulated sugar and cinnamon. Set aside. Heat 3 inches of oil in a deep saucepan to between 350 degrees F. - 375 degrees F. fill a large saucepan 2/3 full with vegetable oil and heat to 350 degrees F. Remove batter from refrigerator and slowly squeeze 3-inch long strips of batter into the oil. Fry in batches, until golden brown, 5 to 6 minutes, flipping halfway through. Drain churros on paper towels. Roll warm churros in cinnamon-sugar mixture to coat. 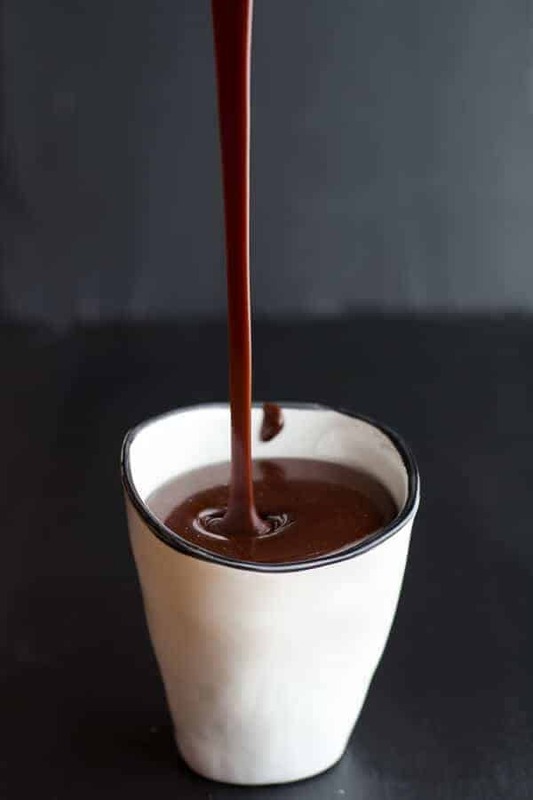 Serve warm with the chocolate cajeta. FYI, the plate above was completely devoured seconds after this shot. Just sayin. No diets before January 2nd. 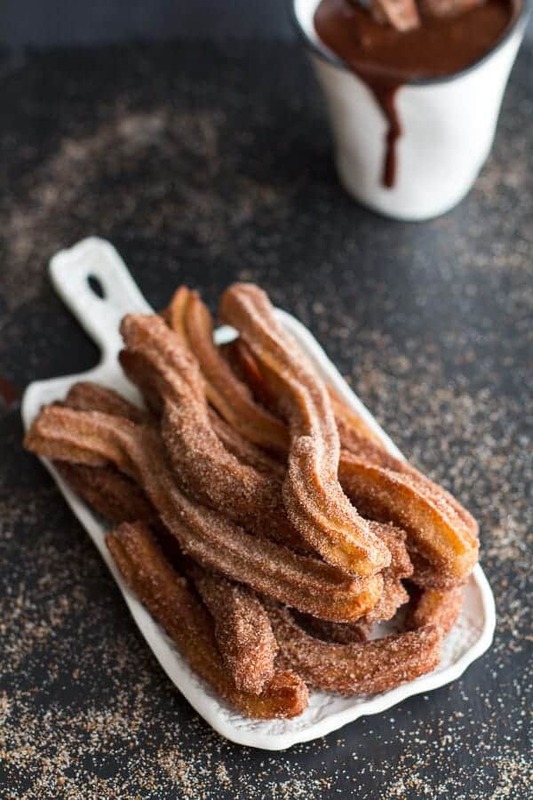 These look so wonderfully decadent – churros and dulche de leche are two of my most favourite things. 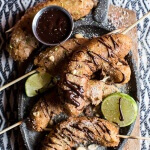 And what a clever idea to add beer to the batter – can you taste it in the churros? Or is it very subtle? Thanks skye! You cannot taste the beer in the churros, it just make them very light! Yes! I agree! Thank you so much, Taylor! Hope you had a great Christmas as well! Tieghan, these must be marvelous; on my menu for New Years! Question – on item #5 re oil/frying – there is a little confusion re oil amounts, etc. Will you clarify this? Thanks. I like to use a large soup pot and fill the oil about 1/4 to a 1/3 of the way full. Just enough oil so the churros have enough room to be submerged in the oil (maybe a few cups). Hope that helps and I hope you love these! Thank you, Averie!! These were so good, I know you would love them. I made mine extra cinnamony! Thanks Kathy!! The dough does not need to be refrigerated at all, but if you wish to make it ahead of time it will keep for up to 2 days in the fridge. These would totally make The Beeroness proud! Hell, I am proud! I know the magic of beer in baking- they make a very light cupcake too! Yum! Now you convinced me to try this! See this is why i love what you do. You first attempt to make it healthy for us, which you ultimately sacrifice for taste. You’re looking out for us!! You’re totally right, this is perfect New Years fare. Delish! Ha! Thanks so much, Todd! Happy New year! 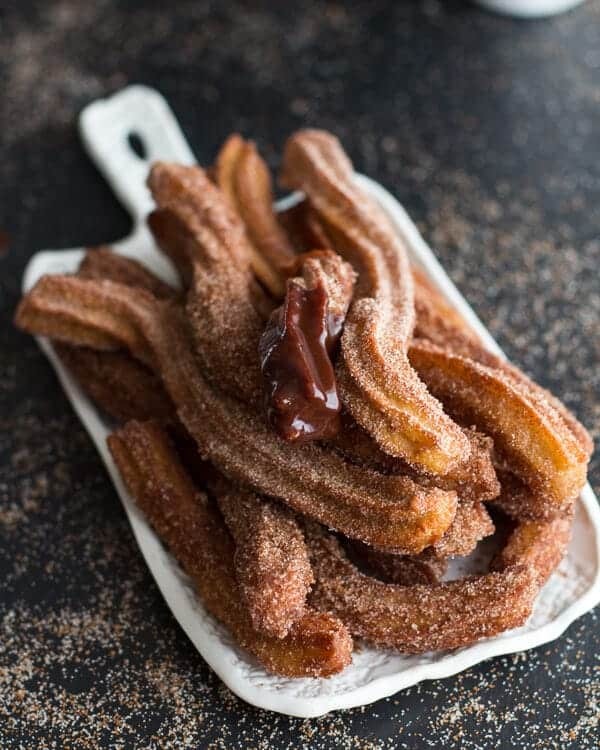 Making Churros is on my bucket list! These look beautiful! Thank you, Julianne! Merry Christmas (a little late, sorry) and Happy New Years! Well… these just done left me speechless!!! A yeah!! I love making you speechless! Thanks Ashley! I just got back from Puerto Rico and with me came a newfound love for dulce de leche, I already adored churros before I went, which means these are essentially perfect. This dessert looks absolutely magical and I’m pretty sure they don’t count as alcoholic if it’s all being cooked off right? That means my parents will totally let me make these. I hope. Haha! Yes, that is what I think at least. I feed these to my younger siblings and pretty much all my other boozy treats. I figure most of it gets cooked out anyway! These look incredible! And I love dulce de leche but have never added chocolate. Brilliant! Thank you, Laura!! You would love a chocolate dulce de leche! 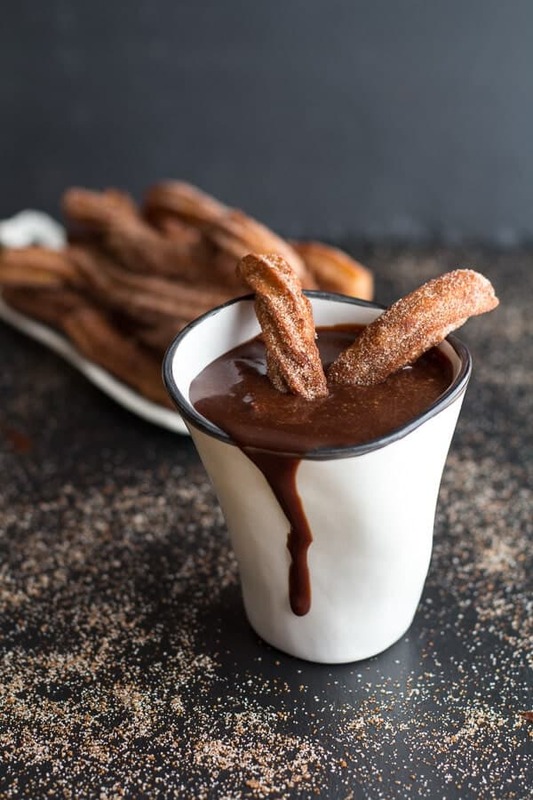 I absolutely love churros and I loved how you made the chocolate sauce for them Definitely bookmarking and trying these! Thank you so much! 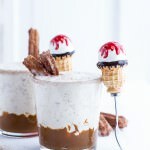 The chocolate sauce makes these! I’ve been afraid of frying things for such a long time, but these look so good I might just have to try them! 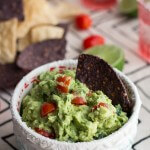 Well, you knooooow, because this was a Mexican post, your related posts are already full of colorful, (slightly) healthier options…so..it’s like running 5 miles and then having a pile of fries or something. 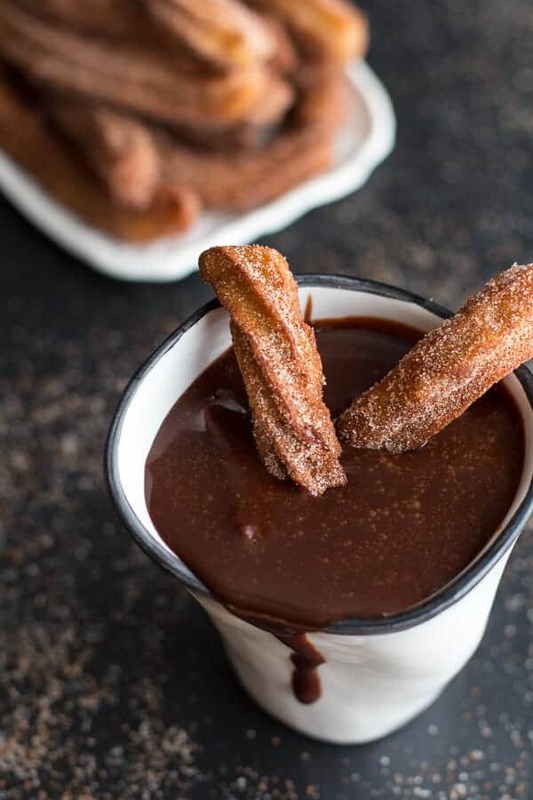 ;) Personally, I’d take the churros though…these look amazing! Wow these look amazing. So amazing. And I love your pics. What a great holiday desert. These look just fabulous, Tieghan! 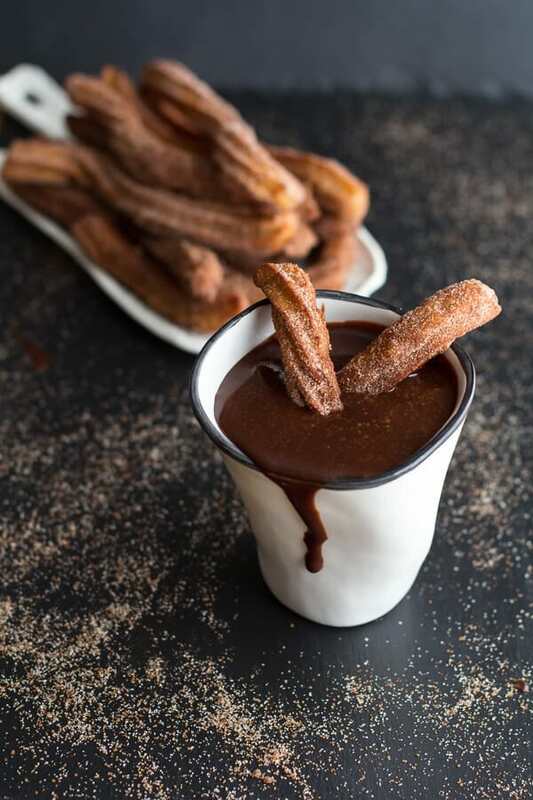 I ate many ‘churros con chocolate’ when I stayed in Spain for a few months while studying and they are just divine when they’re fresh out of the oil and served with a rich chocolate sauce … just like these! What I really love about this post though are the photos … they make me want to reach into the screen and grab grab grab! Wow!! thanks so much, Helen!! I bet those churros from spain were incredible!! I loooove these! They look lovely! 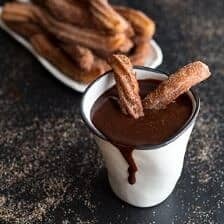 Love churros and hot chocolate. It will be perfect for New Years’s eve! Thanks Vicky! Happy New year! These look awesome! I’ve always wanted to try churros. Thanks for posting these! Thanks Jenn! Happy New Year! There’s nothing like a fresh churro. Yours look better than the average churro, though…yum!!! I just have to tell ya that I made this recipe 3x within 24hrs, seriously! The first batch I made I had to beg everyone to try (mine were Not as pretty as urs) , but after that they were begging me to make more. I fried them in coconut oil, delish. SO happy you loved this!! Thanks so much for making them, Sarah! great recipe, but i am muslim and its not allowed to have beer (( alcohol)) in the food or in drinks. Hi! Water will work as a great sub. Hope you love these! I was wondering if I could use normal beer like Budweiser. Is it possible? And would it make them taste differently? Hey! You can use whatever beer you love. Wow. I just made two batches in less than 24h and I must say: these are the BEST churros I’ve ever made! I’ ve made some slight adaptations, adding one more egg and a splash of milk, so that the dough resembles more of a choux dough, but your taking at the beer stuff is amazing. A real keeper! 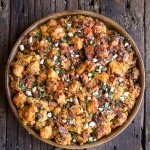 (I’ve posted on my website with credits for your recipe, but it’s all in Portuguese- I’m from Brazil). Congrats!!!!! Going to make these today for fathers day. Hi Caroline, heating them in the oven and making then in advance will be totally fine. Hope these are a hit! !